This article demonstrates how to use an OData generated client. The OData client is generated using a T4 template. This T4 template generator is a NuGet package which can be added to your Visual Studio. The generated C# classes from the T4 template have some drawbacks per default, but you can fulfill your standard requirements using this without any changes. If required you can edit or change the template. 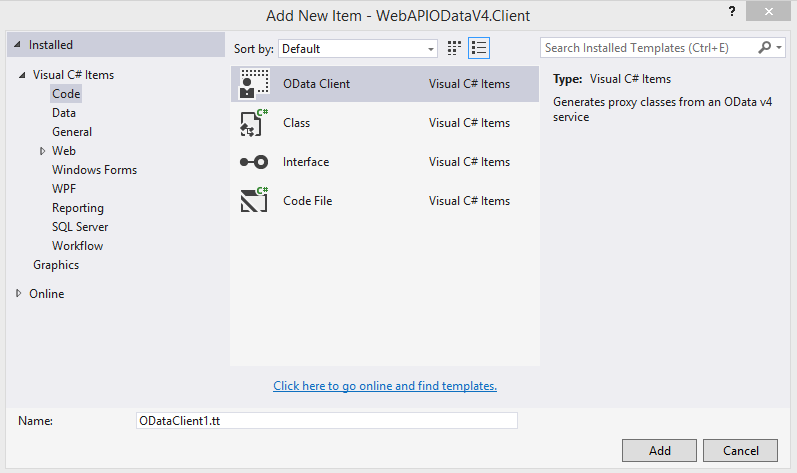 This post is part 8 of the Web API and OData V4 series. 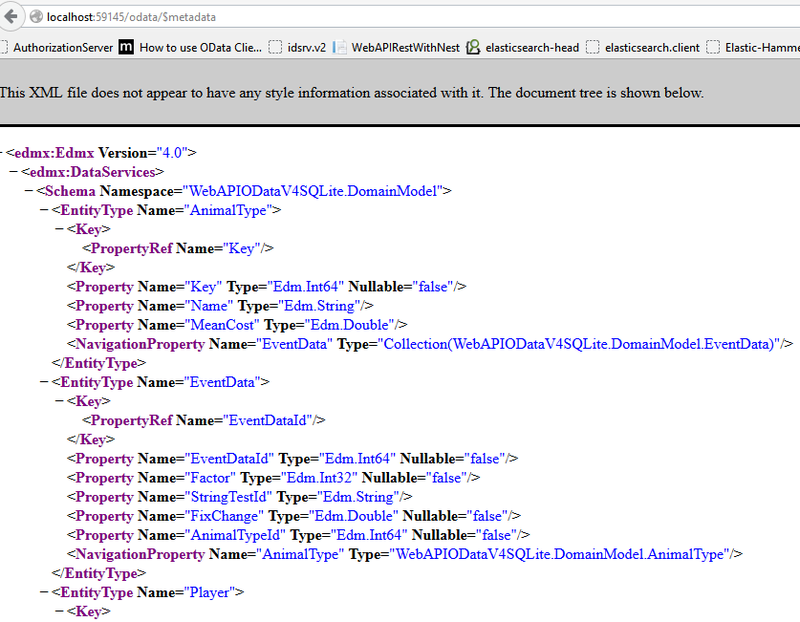 Part 1 Getting started with Web API and OData V4 Part 1. 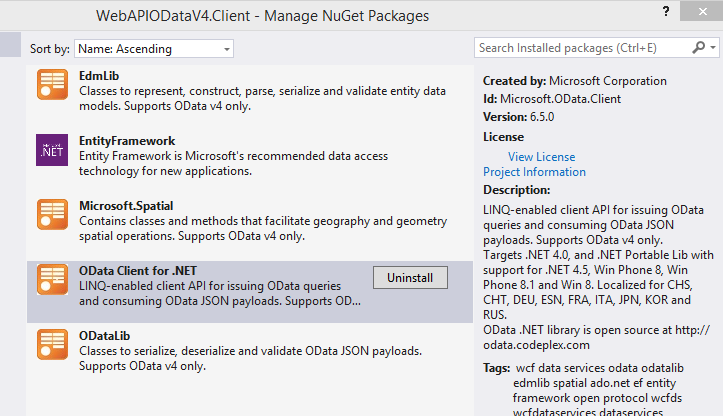 Before you can use the OData Client Generator, it needs to be installed or updated in your Visual Studio. 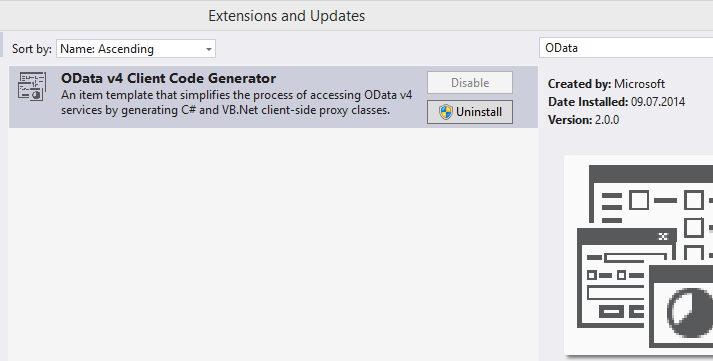 In the tools menu click Extensions and Updates and install the OData v4 client generator package. Now that the service is running, go back to the OData client. In the T4 template, add the URL to the MetadataDocumentUri member. Right click the OData T4 file, and click Run custom Tool in the context menu. This creates the C# file from the T4 template. Now start the application and everything should work. Here is example of some selects on the Entities and also the singleton. If consuming an OData service in a C# application, this client can be very useful. It is easy to use and quick to setup. Reblogged this on Dinesh Ram Kali.. I tried to insert an object which contains nested objects with no luck. would you please guide me in this. I’m working with a big edmx file, to create the model the proxy read the XML file and it takes some seconds,file is arround 20MB, any idea where i can filter the entities to decrease the size of this file.